Get Your BRAVE on! 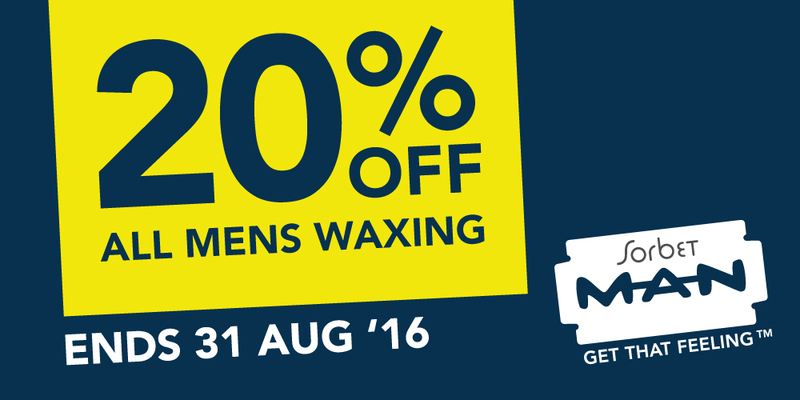 Get 20% off all men’s WAXING… For the whole month of August! Stay Calm – it’s not as bad as you think! With 20% off waxing for the month of August we suspect you’ll become a waxing aficionado after we’re done with you! Come on gents Woman have been bravely waxing for years – now it’s YOUR turn to get your wax on! Weather your hairy chest needs a touch up or your hairy back needs some full on servicing, waxing this August is not just for the novice but for the gent who likes to clean-up, shape up and most importantly WAX UP! Ts and Cs Apply- Sorbet has the rights to end this promotion at anytime! This special excludes any current specials, discount vouchers and facial combos, promotion ends 31 August 2016!